Existing conditions did not suggest a showstopper. Built in 1960 as an office addition to Battle Hall, the West Mall building was a warren of tiny rooms, the windows facing west. The concrete pan joists of the ceilings were low and inflexible, and so was the budget. 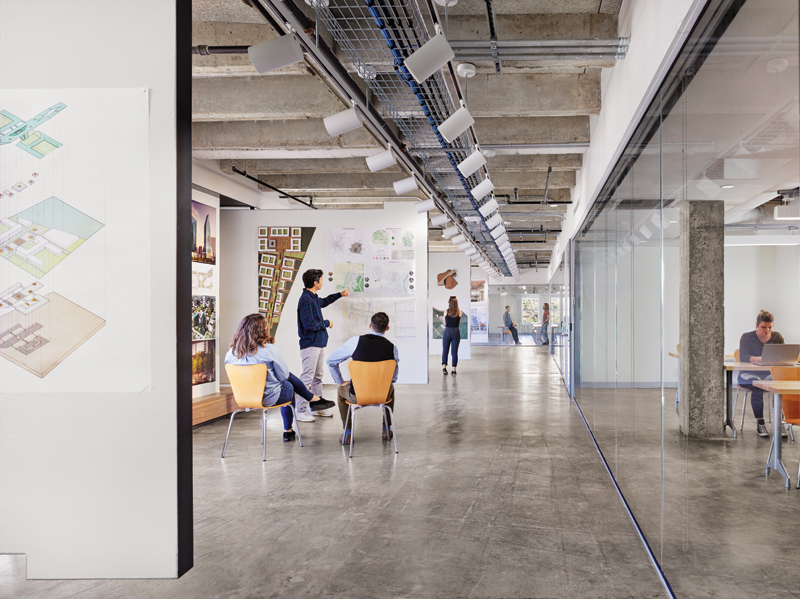 But it was real estate in the right location, so Speck and his team set out to transform the 5th floor office spaces into classrooms and a pin-up space for student reviews. 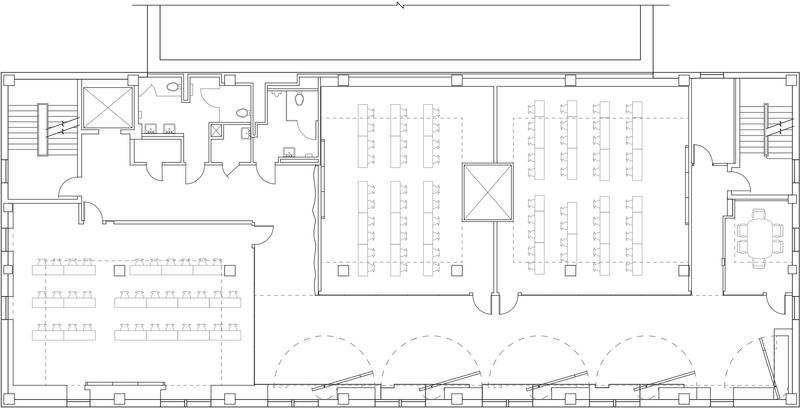 Page’s solution places two classrooms along the windowless east wall and a third in the northwest corner. 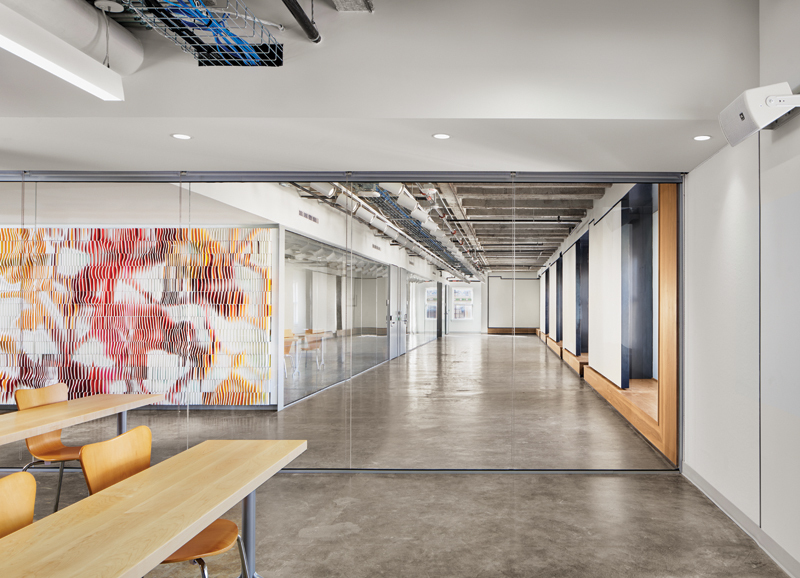 The classrooms’ interior-facing walls are floor-to-ceiling glass, creating a sense of continuous space. The remaining space is now a long gallery with tall west-facing windows. To control the western light, Page designed five wall-sized pivoting panels that fit the window bays and can be maneuvered to block the sunlight as necessary. Framed in steel and clad in easily replaceable Homasote, these panels double as pin-up boards for reviews. When configured perpendicular to the windows, they break the gallery into six smaller rooms. A long sill catches the panels and provides a place for physical models. The project’s success, Addington says, comes in part from smart choices about where to spend money. Walnut, glass, and light-emitting display screens play off the roughness of the shell. The concrete floors are polished but still show the marks of the previous walls. Sound is tempered by Tectum panels adhered to the underside of the pan joists. Pull-down outlets allow for flexible configurations of classroom furniture, and videoconferencing capabilities allow for the input of remote guest lecturers and reviewers. For Addington, however, the most important aspect of the renovation is the pedagogical shift that results from increased visibility. 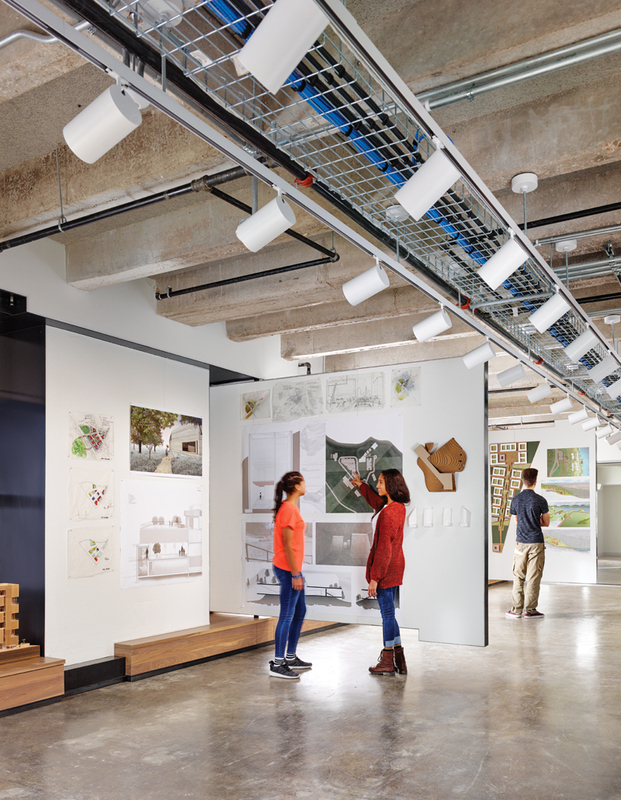 Schools of architecture are often divided into camps — drawing or digital — with digital technology relegated to dark, basement rooms. Now, advances in screen technology allow displays to function even in full light. The simultaneous experience of the classrooms and review spaces includes and integrates different approaches, says Addington, and is already helping to bridge the perceived divide between methods. The combination of digital and print media makes for richer presentations, and, as Speck notes, allows students to practice the kind of storytelling and choreography that will serve them well in a professional setting. Kory Bieg, an assistant professor at UTSOA, encourages his students to embrace both digital and analog tools. When his advanced studio class was invited to design and construct a wall piece for the new classroom area, Bieg set a few parameters: First, the end product would be didactic, so that future students could look at it to understand how different tools might be used. Second, he wanted to emphasize to his students that no one software program can address all problems. For this project, his students were required to use three different programs to explore different facets of design and fabrication. 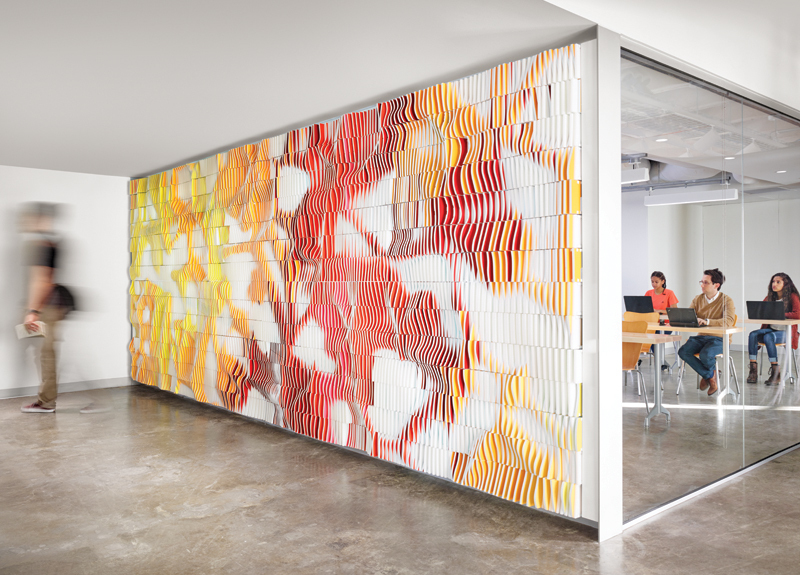 The resulting product — a digitally-designed, hand-assembled sculpture called ONDA Wall, derived by mixing the topography of the UT campus with an abstract, computer-generated topography — greets visitors as they enter the space. Jessie Temple is an architect and writer in Austin.